In a series of surveys run by The Duke of Edinburgh’s International Award Foundation, two groups of young people (13 – 25 and 16 – 25) and nearly 2,000 adults (aged 25+) were asked their opinion on the challenges and opportunities that young people face and the skills necessary for success in today’s world. The survey found that 7 in 10 young people feel they face more uncertainty today than previous generations did. Further, 6 in 10 think growing up is more complicated than it was for their parents and grandparents. The surveys mark the launch of a new #WORLDREADY campaign, which aims to drive awareness around the importance of non-formal education in supporting the development of young people. It also celebrates the achievements of more than 1.3 million Award participants (and millions of previous participants), in 130+ countries and territories around the globe. The campaign was announced yesterday in Accra, Ghana, during Forum 2018 – a triennial event which sees the senior Award leadership from around the world come together to discuss the challenges and opportunities that young people face today and how the Award may be able to support them. His Royal Highness The Earl of Wessex, Chair of The Duke of Edinburgh’s International Award Foundation, joined His Excellency, Nana Akufo-Addo, The President of the Republic of Ghana and other officials for the five day event. In Nigeria, The Duke of Edinburgh’s International Award is known as The International Award for Young People Nigeria. It was previously run under the name The Nigerian National Youth Award (NNYA) until it was revamped in 2014. The Award currently sees more than 5,000 14-24 year olds participate every year. Thousands of young Nigerians are stepping outside their comfort zone and discovering they are capable of so much more than they ever realized, by getting involved in The International Award for Young People Nigeria. 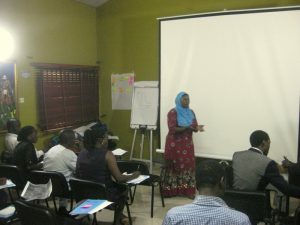 For more information please visit: www.intaward.org.ng or www.worldready.org. The Duke of Edinburgh’s International Award Foundation, London in collaboration with The International Award for Young People Nigeria held a 30-4-30 event at the Lagos Polo Club, Ikoyi on Thursday the 22nd of February, 2018. 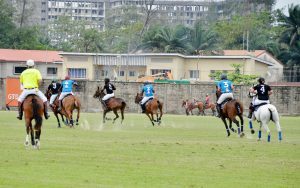 The event which was held in celebration of the 30th Anniversary of the World Fellowship and the 30th Anniversary of The Duke of Edinburgh’s International Award Association took the form of a Polo charity match played between Lagos STL and Lagos Caverton Sao Polo. 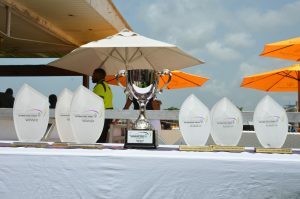 The event which was hosted by Mr. Olawale Edun, a World fellow and International Trustee of The Duke of Edinburgh’s International Award Foundation and Chair of the Board of Trustees of The International Award for Young People Nigeria; was attended by representatives from proud sponsors: FBN Quest Asset Management, EFG International, Guaranty Trust Bank Plc, PW Nigeria Limited, Access Bank Plc and Prudent Energy and Services Limited as well as by invited guests and polo enthusiasts. The charity Polo match finished 41/2 to 8 in favor of Lagos Caverton Sao Polo. The Duke of Edinburgh’s International Award is the world’s leading youth achievement Award available to all young people aged 14 to 24 that brings together practical experiences and life skills to equip young people to succeed in life. The Award which operates in over 140 countries and territories; is run in Nigeria under the approved name The International Award for Young People Nigeria. The World Fellowship is a prestigious global network that brings together generous individuals with a shared interest in the development of young people. It was created in 1987 by HRH Prince Philip, The Duke of Edinburgh to support the long-term development of the Award and the young people it supports. The event was aimed at raising at least £30,000 to celebrate the 30 years anniversary of the World Fellowship and an additional £20,000 to help more young people in Nigeria to undertake the Award. The funds from this event will be used to help grow, develop and improve the Award in every country so that they can fulfill their long-term ambition of universal access for all. The Online Record Book (ORB) is an online record book platform for participants to record all their Award activities at the Bronze, Silver, and Gold level. But guess what! The next generation Online Record Book is way better, faster, simpler and more accessible than ever before! Improved Online Record Book makes it easier to record and review your Award activities anytime, anywhere offline. The best part is you can download the app! Excited??? Get ready, the new generation is here. Fun, excitement, and adventure – these were emotions expressed by the Award participants from Avi-Cenna International School as they set out for their final qualifying Adventurous journey. 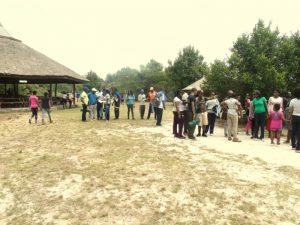 Upon arrival at their base camp which was situated in French village, Badagry, the Award participants were divided into groups and engaged in some team building activities to emphasize the importance of team work, and each member contributed to the success of their respective groups. On Saturday at exactly 6am, the whistles were blown and all the participants gathered on the field for their morning drills which got them physically prepared for the expedition, after which breakfast was served and preparation towards the expedition ensured. They journeyed from the French village to Seriki Williams Abass slave home, which once housed 1600 slaves in forty rooms, there they saw the shackles and gruesome metals used to chain the feet of slaves as they worked on the plantation, and also learnt new facts about the slave trade, The next check point was the “point of no return”, as they walked along the same route, different surges of emotions and thoughts lingered through the minds of the participants, after which they journeyed by boat to Gberefu Island. On the island, more historical tales about slave trade were shared. The participants then prepared their lunch, after which they packed up and headed back to the base camp. On the way back, they saw the first story building in Nigeria, which was built in the year 1845 and visited Oba Akran palace, also they saw the first primary school which was founded in the year 1845. On their arrival to the base camp, they rested and later assembled for their debrief and presentation of their Adventurous Journey report to the assessor. Adventure is the unusual experience which comes from activities full of courage, excitement and joy. 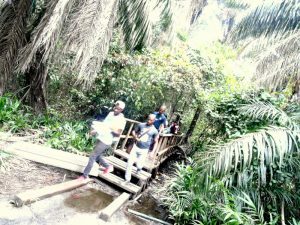 On the 25th of November 2016, the year 10 students of Day Waterman College, Abeokuta undertook their Practice Adventurous Journey which was a 10km expedition from their camp site to and from Magbagbeodun Village. The participants were divided into several groups and each one of them played a vital role in the overall success of their group exhibiting qualities like team work, perseverance and communication. Fatigue was a major challenge some of the participants encountered, but it didn’t alter the whole experience from being an exciting and eventful one. 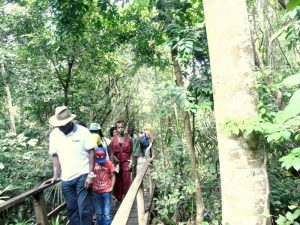 According to a report presented by one of the participants ’’It was an unexpected, but rather interesting experience, the reason being that we walked ten thousand metres! I can personally testify that this activity has taught me about social interaction. We had a motivator who encouraged us through the ups and downs, and made sure we didn’t give up. Being a leader, I had to come up with different problem solving ideas for my group members and put their needs before mine. We had a great time and we look forward to undertaking our final Adventurous Journey’’. The expedition was highly beneficial to both the participants and their Award Leaders as it encouraged them to strive for success regardless of the inconveniences or situations presented to them. Noble Hall Leadership Academy is an all-girls school located in Abuja. 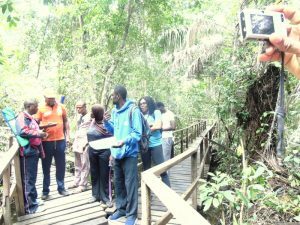 On the 6th day of May 2016, Award participants from the school undertook their Practice Adventurous Journey which commenced with training for the participants on understanding of the goals of their Adventurous Journey, they were then divided into groups for better integration. Early the next morning on the 7th – 05 – 2016, the participants engaged in aerobics for improved physical well-being to build their fitness and keep them alert. After breakfast, the participants had lectures on safety (firefighting using the extinguisher) taken by Mr. Olaogun a practicing fire fighter, this was followed by a seminar on first aid precautions and measures to take for different types of accidents, the participants also had an interactive session on leadership to enlighten them on how to be leaders and give back to the society. The day continued after the participants had lunch, and then engaged in a challenge learning how to overcome or outrun a hurdle. They had fun doing the challenge while at the same time recorded their speed, performance and accuracy. The day came to an end with the participants making their dinner in groups thereby learning to work as a team,the participants from the different groups also shared meals, Mrs. Balikis the adventurous journey vendor gave a general vote of thanks announcing the kick off time for the long distance trek. Early the next day on the 8th, they made their breakfast and headed off for the long distance trek. They took note of observations while trekking, took readings with the compass, and calculated distance covered. The walk lasted for about two hours and the total distance covered was 16km. In the words of the participants, it was an exciting experience for all. We are pleased to announce that The International Award For Young People Nigeria has relocated its offices to Block 8, Plot 6, Wumego Crescent, Lekki Phase 1, Lagos State. The new building is off Sule Onabiyi Street, off Christ Avenue, Lekki Phase 1. When you are in the neighborhood, do not hesitate to stop by our new location. We hope you will visit our new location soon. With the youth making up 43% of Nigeria’s population according to business day newspaper, it can be said that the future lies in the hands of the youth. The Duke of Edinburgh’s Award under the name the international award for young people Nigeria in Nigeria, is set to equip and empower the youths for the present and future through the DOFE programme. The programme sections consist of activities that improve the body and mind; it is also highly value laden as it instills values like self confidence in the participant. The Award gives the participant an avenue to give back to society through the community service platform and also improves present skills while impacting new skills to the individual. The Award is set to create better individuals, who in turn affect the world positively.